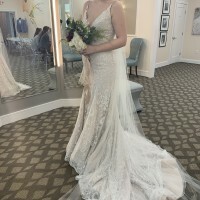 I lost a lot of weight and no longer had the curves for this dress! I got a new one which is why I am selling this one. Its completely stunning, perfect new condition, never altered. It has boning in the bodice which pulls in your waist and is so flattering. There is super intricate beading all over the dress and old-fashioned buttons that go all the way down onto the skirt. It has a cathedral length train and will give any bride that WOW moment she's looking for! I can't wait for someone to find this dress and look stunning on their wedding day.